Prepare, cook, serve, and store in the same cooking vessel. Freezer to oven to table to refrigerator safe. 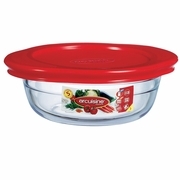 Use in conventional or microwave ovens. The bakeware is made with Borosilicate which is the best glass for cooking in the oven in total safety. Only borosilicate glass can offer both resistance to thermal shock and safety. Follow instructions on label. Recommended for use in oven,microwave. Do NOT use under broiler, grill, top of stove, no abrasives scourers/powders. DO NOT put hot dishes on cold/wet surfaces, or put cold liquids in hot dishes. BORON and TEMPERING ensure a double guarantee of resistance to thermal shock. Superior heat resistance + Superior chemical resistance = Superior quality. Scratch and Stain resistant.